Cambria Parc, Lennar’s fabulous new townhome community is now selling and has move-in townhomes available. The community is slated for 218 luxury townhomes where buyers will have 4 distinct floorplans to choose from. 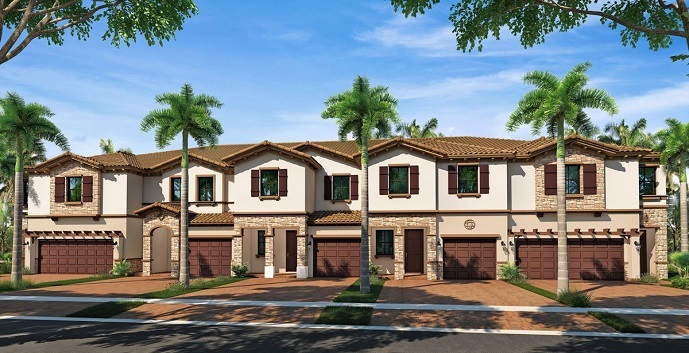 Located in desirable Boynton Beach, Cambria Parc will offer two story townhomes with either 3 or 4 bedrooms and 1 or 2 car garages. The townhomes in be part of Lennar’s signature “Everything’s Included”. Residents at Cambria Parc will enjoy a community swimming pool with cabana, picturesque walkways with a park and gazebo. The homes will range in size from 1,759 square feet to 2,023 square feet. Cambria Parc Townhomes by Lennar offer 4 townhome models to chose from. Aspen - 2 story townhomes, 3 bedrooms, 2.5 bathrooms, 1 car garage, 1759 square feet. Cedar - 2 story townhomes, 3 bedrooms, 2.5 bathrooms, 1 car garage, 1828 square feet. Darlington - 2 story townhomes, 3 bedrooms, 3 bathrooms, 1 car garage, 1879 square feet. Evergreen - 2 story townhomes, 3 bedrooms, 3 bathrooms, 2 car garage, 2023 square feet.